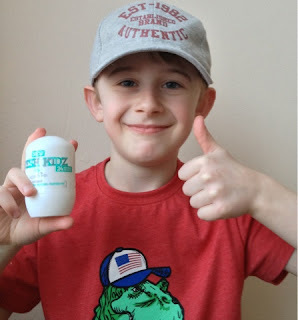 We were sent some Fresh Kidz roll on deodorant to review, it is part of a new deodorant range Keep it Kind, uniquely designed for kids. My Son is very active he loves to play football at school, he has noticed he has started to sweat afterwards, but now he is using his new deodorant it will allow him to feel fresh and confident all day. he has been using his new Fresh Kidz roll on deodorant for a few days now and he really loves it..he feels so grown up just like his dad....as his mum i wanted him to be able to use a deodorant that is natural and gentle on his skin, but the the same time provide all day protection... Fresh Kidz roll on deodorant is unisex and suitable for children aged 8+ it is fragrance free,suitable for all skin types,it does not mark or stain clothing or block pores, allowing the skin to breath. Fresh Kidz is available at Boots stores nationwide and online priced at £2.99..we are very happy with this product and will be buying it in the future. Keep it kind also have spray deodorants aimed at young teenagers 11+ they have Blast for boys and Missy for girls these are also available at boots priced £3.29 each. My daughter was sent this to try and she also thought it was a great product. I'm so glad I came across this post,my 8 year old daughter has started sweating I didn't know what to do as I don't want to use adult antiperspirants on her.